After reconstruction of the church following a fire in Stade, Berendt Huß from Glückstadt began construction of a new organ for the church of Sts. Cosmæ and Damiani in 1666. Two years prior to signing the contract for the Oberwerk, Huß's nephew Arp Schnitger joined the workshop. The contract for the Rückpositiv was signed in 1670, the Pedal in 1671, and the Brustwerk in 1672. 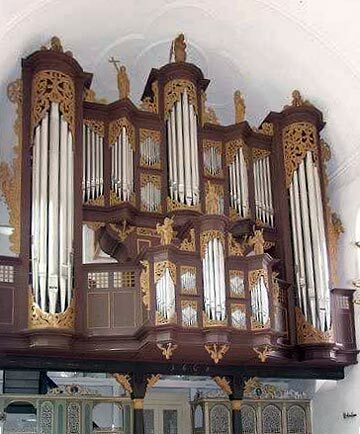 The organ was completed in 1675 with notable influences of the young Schnitger: inner pipework was of a 23% tin alloy, and the arrangement of the façade pipes corresponds with Schnitger’s later work. The Oberwerk chest, the oldest, is a spring chest as opposed to the later convention of slider windchests. Vincent Lübeck was organist from 1675–1702. At his request, Schnitger installed the Trommet 16' in the Oberwerk. The Glockenspiel (45 bells) was installed at the end of the 18th century. A complete restoration of the organ was completed in 1975 by Jürgen Ahrend of Loga-Leer.